How often do you spend time talking positively about yourself? It’s so important to be kind to yourself. 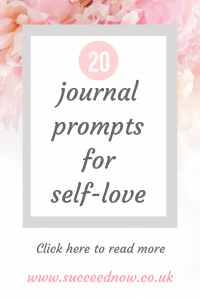 These journal prompts for self-love will give you a good start. Schedule time into your day to journal and use some of these journal prompts for self-love every day. Write whatever comes to mind and don’t judge your answers. Be free and allow yourself to write what you feel. How did that make you feel? It is natural to feel emotion when journaling with prompts like those. It is a great way to connect with yourself and promote self-love. 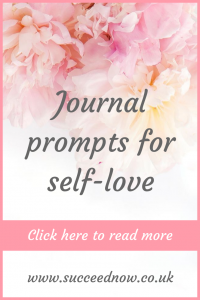 Feel free to create your own journal prompts for self-love that feel good for you. Make this a daily habit and come back to these prompts whenever you need some inspiration to get started with your journaling. Schedule the time into your day for journaling everyday. Pick a time that works best for you, set an alarm if you need to and create the habit of journaling daily to improve your mindset. You can also journal openly, about your thoughts and feelings, this has many benefits to your mental health and mindset. I like to do “positive journaling” meaning even if I have something negative on my mind I change it into a positive by writing a lesson learned from it. Another great way of journaling is journaling about gratitude. Taking the time to reflect on everything you have to be grateful for in your life. This is a great way to stop taking the “essentials” for granted and realise that you should be grateful for all you have. Extra tip – write a short paragraph to yourself that you can read when you need an extra boost. You can record this on your phone and play it yourself when you are feeling down. Let me know how you found these prompts over in the Facebook group.